"Yeah, I like vintage. I always wore vintage, but I realize that I getting kind of old for... Well I'm over 30, so I want to wear clean clothes finally, so I want to buy stuff that looks vintage, but is new. I'm at Project and I translate for Japanese customers." I like the mix of subtle patterns and materials that Kay is wearing. Their is an effortless magpie chic to her ensemble. I spy her gauzy thin shirt, wool pants, cotton and wool sweater, glass beads and her tapestry purse. She does a great job of doing the new stuff that looks like vintage style. 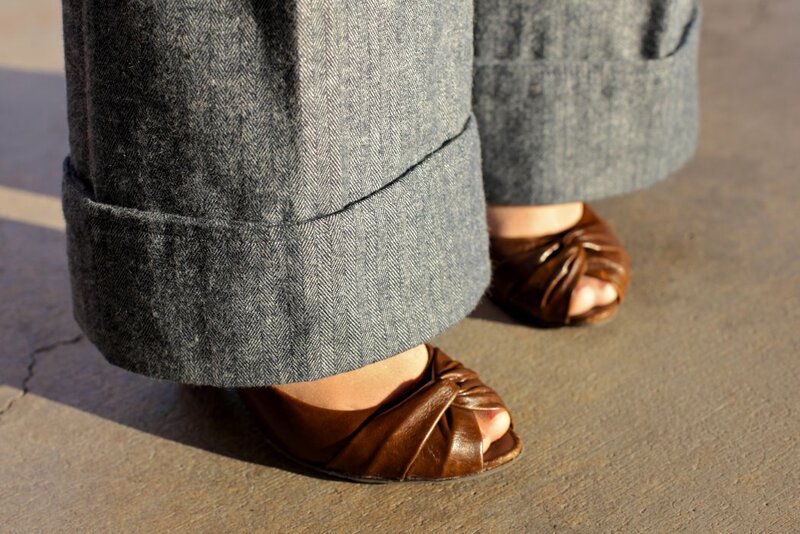 Peep toes peeking out from under perfectly wide-cuffed trousers. Oh she looks so fab, I saved to my lookbook.